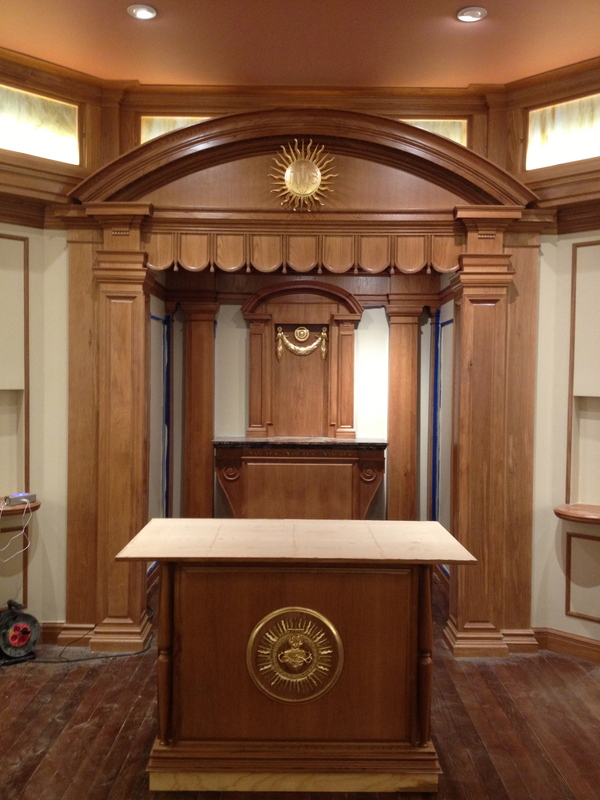 With the inauguration of the Year of Faith promulgated by Pope BXVI in the fall of 2012, the Jesuit community of Jesuit High School in Tampa, FL, was inspired to undertake the renovation of their existing 1960’s community residence chapel. I was subsequently commissioned to create the designs for the renovation, which ultimately included just about everything in the space– all trimwork and millwork and stonework, the window grilles, pews, reredos, altar rail, lectern, altar, side altar, statue pedestals, etc– except the statuary and the metal pieces such as the altar cross, candlesticks, and holy water fonts. The existing structure– an unequal octagonal edifice with board and batten siding, stone-clad piers, and copper sheathed clerestory– was entirely retained and provided the skeletal framework, and thus the limiting conditions, within which the interior was to be reconceived. The existing interior, also still dating from the original chapel construction, was comprised of a central octagonal worship space circumscribed by perimeter storage and sacristy rooms, woven cloth walls under a veneer of wood batten strips in the nave, terrazzo slab floors, and applied abstract stained glass treatment at the perimeter windows and clerestory. The new interior was conceived as a complete cosmetic renovation with an extensive and entirely custom-designed and fabricated millwork and furnishing package. Teaser photos of a chapel renovation in progress for Sacred Heart Chapel at Jesuit High School in Tampa, FL, for which I provided the designs. Photos taken last week, with final work and cleanup completed this week, and the dedication Mass set for Jan. 5, Updates to follow thereafter.